Hint: The easiest way to find the size bracelet needed for your watch is to check your old band. Many times manufacturers imprint the back of the band with the lug size. Watchbands come in different lug sizes. The lug size of the band is the width of the ends where the band attaches to the watch face. Lug sizes are measured in millimeters. You can measure the lug size of your watch face by measuring the distance between the two watch lugs with a caliper. If you are using a ruler, we have provided a conversion chart below. However, the most accurate way to measure millimeters is with a caliper. Bands are generally made in short, regular, long, and extra-long lengths. The easiest way to determine the length of band needed would be to measure the old watch strap you are replacing. Measure the length of the watch face from where the band attaches at the top to where the band attaches at the bottom. *If you need assistance choosing the correct size band, contact us and we would be happy to help! We can change the buckle color on any leather band to silver tone, gold tone, or rose gold tone (subject to availability on rose gold tone). Please add a note in the message section at checkout to request a buckle change. Use a thin metal implement to remove the spring bar from the buckle. Slide your tool in between the inside of buckle and the edge of the band. Use the implement to push the spring bar down. This will detach the buckle. Remove the buckle from the band. Take the tongue piece of the new buckle and insert it into the notch in the band. Slide the spring bar through the band and the buckle’s tongue. Anchor one end of the spring bar into the top of the buckle. Using your metal tool, push the spring pin down and set the pin in place. We cannot alter the length or width of leather bands. 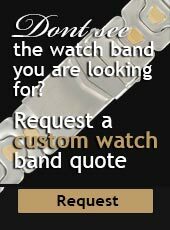 If you need a band with certain specifications, we can place an order for a custom order watch band for you. We can add or remove links from a metal link watchband upon request. 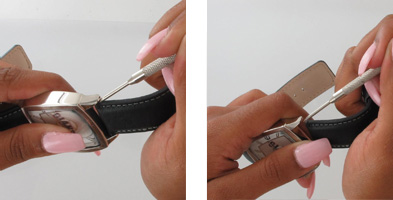 Shortening Watchbands – We shorten watch bands for no additional charge. We can remove links to shorten a band to the length needed. Please contact us to request having a band shortened. Be sure to specify the length needed in your request. Adding Links to Watchbands – We can add links to a watch band for an additional charge. Please contact us to ensure we can make the customization prior to purchasing the band. 1. Set up your work space. Lay out a soft cloth to prevent the watch face from getting scratched while you attach the band. Also, find a flat metal implement that can be used to remove the spring bars. 2. Use a flat metal implement to remove the spring bar. Slide the implement between the band and the watch face. Use the implement to push down the notch on the spring bar and remove the band from the watch face. Be sure to save the removed spring bar, you will use it to attach your new band. 3. Repeat step 2 to remove the other side of the old band from the watch face. 4. Attach the new watchband. Insert the spring bar into one end of the new watchband. Anchor the band by inserting one end of the spring bar into the watch face. Use your metal implement to push the spring bar down. Slide the band into place and align the spring bar with the holes in the watch face. Remove the metal implement and allow the pin to pop into place and hold the band in place. You can ensure the band is attached by slightly wiggling the band to ensure it doesn’t detach. 5. Repeat step 4 to attach the other end of the band to the watch face. 1. Open the back of the clamp on both sides of center catch. 2. Remove cords from the clamp. Thread the cord through watch. 3. Reattach the cord into the clamp. 2. Open clamps. Caution: Do not remove cords from clamps. 3. Shorten to desired length by cutting equal length from both double cords at each clamp.